Originally posted at 10:16 AM ET: Legendary soprano and queen of bel canto, Dame Joan Sutherland, has died. The Sydney Morning Herald reports that Dame Joan passed away peacefully in the early hours of yesterday morning after suffering a long ilness. 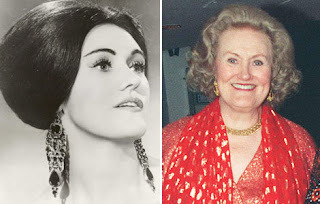 One of the most recognizable female opera singers of the 20th century, she was dubbed La Stupenda by a La Fenice audience in 1960 after a performance as Alcina. Her singing study began early with her mother and she gave her first performance at seven years old on a radio show singing The Bonnie Banks o' Loch Lomond. Singing was not an option for her as a young adult due to the financial constraints it placed on her family. After attending secretarial college, Joan's first job was at the Radiophysics Laboratory and then a firm of farm suppliers. After singing Softly Awakes My Heart from Samson and Dalilah she won a two year singing scholarship and began her study as a Dramatic Soprano. After a quick courtship, Dame Joan married the young pianist, Richard Bonynge. Maestro Bonynge knew that Dame Joan's voice was capable of more than she understood. After tricking her into singing in her upper register, Maestro Bonynge soon convinced her that she was indeed a Coloratura Soprano best suited for the Bel Canto. Soon thereafter, she began singing the repertoire that she became known for. In 2002, Bonynge said of his famous wife: "I always wanted her to have a career more than she did. She was never career-minded at all. But I was concerned for her career because I thought she was so fabulous ... I was never jealous of her - the better she did, the more I was happy." Indeed, the more she sang, the more he conducted because shortly after his 1962 debut in the pit, it became known that you could not have one without the other. That is not to say that he was not a conductor of note in his own right. Together, the two were an operatic power couple, but retired into a quiet life in Switzerland. Maestro Bonynge has continued to conduct but in recent years, Dame Joan was rarely, if at all, seen in public. A few years ago, I had the opportunity (and sheer joy) to work with Maestro Bonynge at San Diego Opera - one night at dinner, upon asking him about Dame Joan, Maestro reported that for the Christmas holiday, he had purchased his wife a heavy duty leaf blower. A look of shock must have been evident because he quickly explained that she was quite happy and thoroughly enjoyed walking around the grounds of their Chalet with the leaf blower strapped to her back, blowing leaves and keeping the place clean. Undoubtedly, Dame Joan leaves behind a legacy of masterful performances and it is safe to say that the operatic world has lost a legendary member of that elite group of previous performers that truly shaped what opera is today. Dame Joan is survived by her husband of 56 years, Maestro Richard Bonynge - their son, Adam and two grandchildren. Rest Peacefully, Dame Joan. Your presence will be greatly missed. Keep traveling down for more coverage and clips of the technical marvel that was Dame Joan.